Creme de Cassis is a liquor made from blackcurrants which are generally grown in the regions of Burgundy and the Loire and Rhone valleys. It is interesting to note that the blackcurrant plant needs to be subjected to below freezing temperatures for 10 weeks or more during winter in order to produce abundant fruit and the berries only maintain optimal flavour for one day! Also, because they are very quickly oxidized once picked ( due to their high vitamin C content ), they must be flash frozen to -30C as soon as possible in order to preserve their colour and flavour. To create the liquor the frozen berries are warmed to -5C and macerated for up to 3 months in a mixture of water and alcohol which extracts the flavour and colour from the berries without the possibility of fermentation. The resulting juice is then decanted, pressed and filtered and sugar added. This style of macerated liquor is given the name "creme" to differentiate it from fermented liquors such as Calvados and Eau de Vie. 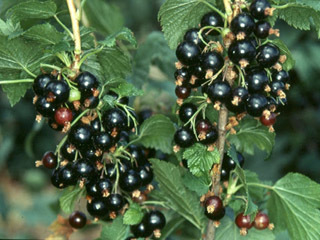 The French name for blackcurrant is cassis, hence the liquor is called Creme de Cassis. It was the mayor of Dijon, Canon Felix Kir who became famous for his involvement in the resistance and for preserving the tradition and knowledge of making aperitifs during the difficult years of the 2nd world war. Mayor Kir would often be seen offering guests to the capital of Burgundy the traditional blanc cassis. This drink, a combination of dry white wine and creme de cassis became know as a "Kir". Other drinks incorporating creme de cassis are:- Communard, a dash of creme de cassis plus a cool dry fruity red wine such as passe-due-grain or cabernet trois and ( a personal favourite of ours ) Kir Royale, a blush of creme de cassis in champagne.